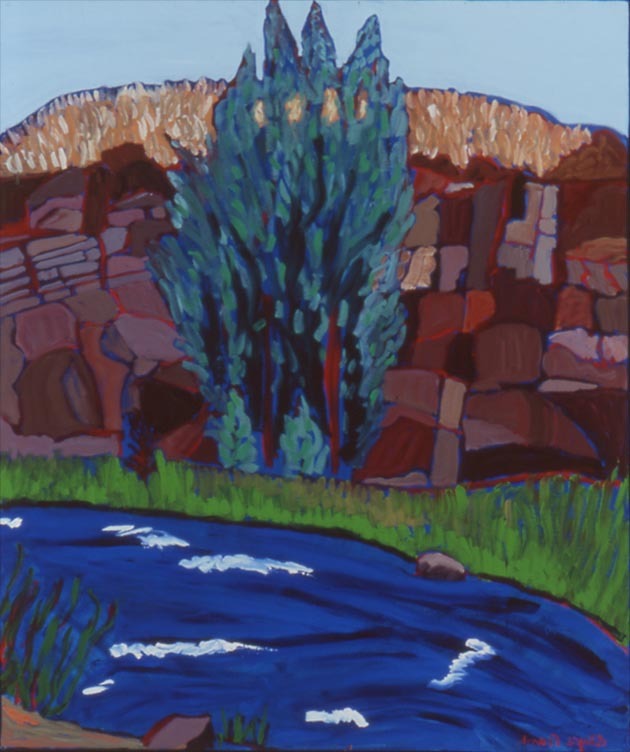 The Hondo River at Penasco, Oil, 36"x30"
The Hondo River in Flood, Oil, 30"x40"
Valdez From The Rim No.27, Oil, 40"x30"
Cumbres Pass No. 3, Oil, 40"x30"
Late Spring Snow At Toas Mountain, Oil, 30"x40"
Alyce Frank was born in New Iberia, Louisiana, but moved at an early age to Los Angeles and then Tulsa, Oklahoma. At age fifteen, Alyce applied to a liberal arts program at the University of Chicago. After her graduation (at age 18) she moved to Los Angeles where she attended graduate school at UCLA and USC. In 1953 Alyce married Larry Frank, a film maker. Alyce worked with her husband producing and editing educational films. In 1962 they moved to New Mexico, where they have lived since. The Franks became avid collectors of Indian artifacts, and it was this avocation that led Alyce to pursue a career as a painter. Her first important lessons were with Ray Vinella, with whom she studied for four years. Later she took a landscape workshop with Bob Ellis, professor at the University of New Mexico. Alyce joined this workshop every summer for six years. In 1986 she was selected for a master class with Richard Diebenkorn at the Santa Fe Institute of Art. Alyce Frank strongly believes in continued training. In spite of her accomplishments she continues to attend different workshops which she enjoys tremendously as she never attended art school in a university setting. Artistically, Alyce Frank is interested in the power of the scene, rather than the changing light. Each painting must be about something special. Her ability in selecting and rearranging the subject is what produces a painting that is distinctively Frank. Alyce begins all her paintings on site. The natural forms so abundant in New Mexico provide a strong framework for her creative process. Alyce Frank often uses a red ground on canvas which is a powerful, non-realistic statement. She will not paint what she sees. She is free from the restraint of the actual colors of the landscape. 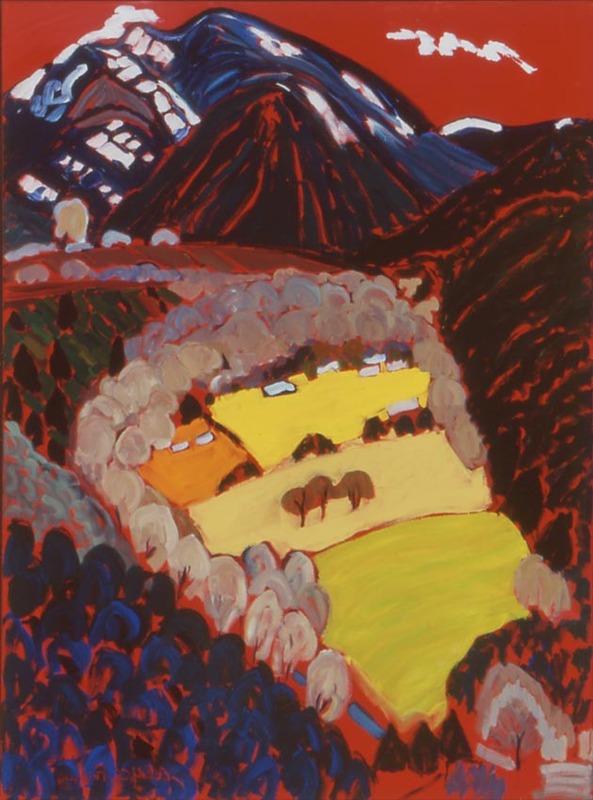 The scene gives her the idea of form and value, but the red ground appearing in the sky, mountains, valleys and fields acts to flatten the surface, again a contradiction of reality. Those who see her work get a sense of the drama of the New Mexican landscape and the pleasure she finds as she goes looking for the perfect painting spot. Alyce has developed mostly a sense of creative harmony in the finished paintings.